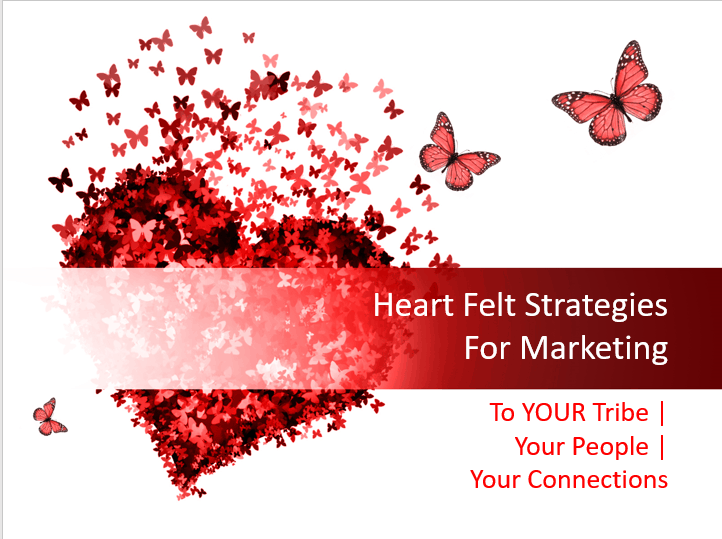 Spend just 45 minutes with me as we explore key strategies for heartfelt marketing — connecting with your peeps or your tribe or people!! Register below and I will send you the details!! If you are like most small business owners that I know, then you find marketing to be one of your biggest challenges. HOW do you get more clients or customers? HOW do you stand out in the crowd of competitors? HOW can your business succeed in this business environment? You are NOT alone!! Tuesday we will spend some time exploring 6 strategies that can make a real difference to you! I am sure that you are using some or maybe even all of these strategies, but are they working? Are you getting new business leads? Do you have ANY conversion? Is it the strategy or is it HOW you are using it? Is it making sense to your connections? During the webinar we will be covering — yes, six strategies but we will also be looking at HOW to make them more heartfelt — more engaging. Connecting with people — PEOPLE directly. Reserve your seat and join me. Can’t make it, sign up anyway!! I will get you the replay following the webinar! I was on the phone trying to solve a technology problem today for 6 hours! 6 hours!! I would love to have attended this but obviously i was having more fun. Please let me know how i can know about the webinars in advance. I would love the replay of today’s webinar. Thanks Judy!! I hate technology challenges. They are such a time zap!! AND totally frustrating as well. I will definitely update you on the next webinar! !